Installing a new loft ladder can be a tricky and complicated business unless you know exactly what you’re doing – here’s a quick guide to everything you need to know! Although most homes these days come with a pre-fitted access point to the loft or attic, that doesn’t always mean it’s easy to get up there. Loft ladders are often old, rickety and poorly kept, neglected through prolonged misuse (or from remaining unused for so long) and rarely maintained to the standards they should be. After all, climbing a ladder even the short way to a loft can be a dangerous business, especially on a landing where the floor isn’t always at its most stable and secure – plus such a small space doesn’t leave a lot of room for manoeuvre if you’re attempting to take things up or bring things down all by yourself. Building a loft is an effective way to produce more space for storage, working, or chilling out. However, it is necessary for family members to climb up and down from the attic. That is why you need to know how to build a loft ladder properly. It is possible to opt for do-it-yourself. You can also look for the best ladder installation company if you have extra budget. Building does not entail sophisticated equipment. A few hand tools and basic knowledge allows you to get things done. Nonetheless, fitting a loft ladder is relatively cost-effective, easy and fast if installed by professionals. In case you decide to go for accurate installation, there are various companies installing loft ladders in the UK. Homeowners can even choose from cut-rate package deals customized to your specific needs. Qualified fitters can install the ladder, loft boarding and lighting altogether. The cost of installing loft ladder depends on the material, design, available space, functions, and personal choice. Ladders range from the regular aluminium to the concertina space saver and more expensive folding ladders fabricated from timber. There are also electric mechanisms which are fully automatic as well as custom-built access ladders. Staircases for loft conversions often come in spiral designs. These spiral staircases are a quirky design element, however, bear in mind they are not the most practical staircase for loft conversions if you plan on moving a lot of furniture up there! A floating-step staircase, as shown in the picture above is another quirky option, however, if you have young children it’s probably not a good idea. If you want something simpler then a standard wooden staircase could be the answer. For a contemporary look, go for metal, perspex or even solid glass steps if you want a really unique design. Once you have decided on the type of stairs, you will need to consider if you are going to be purchasing a bespoke design or a ready-made staircase. The ready-made option is usually cheaper, however depending on the complexities of the project; you may be forced to pay for a bespoke design to ensure that it fits properly and provides adequate safety. Once you have installed your staircase, don’t forget to utilise the space underneath. You presumably wanted the loft converted to allow for extra space, so don’t let this bit go to waste. You could consider turning it into a storage cupboard, for example. The cost of loft ladder installation ranges from £175 – £300 and if you want a larger hatch you will need to add around £250 to the quote. Loft ladder prices also depend on the model. Most varieties are made of aluminium although the heavy-duty steps are manufactured of steel. Fitting loft ladders is easier especially if this is the sliding type. These are fastened to the trusses inside the roof space and come out in two or three sections. Check out low-cost sliding ladders which are made from lightweight aluminium. However, these make a lot of noise and are more appropriate for light use. Nearly all contemporary residential units in the UK have an opening wide enough to meet minimum measurements. These can be extended if you eventually decide to fit loft ladder. There may not be any hatch but it is possible to get a kit which allows for the conversion of the existing hatch into a hinged structure. Fitting a loft hatch is not difficult. Loft ladders installed are built to fit between the scaffolds in your ceiling which severs as the flooring of the garret. It generally requires for existing access holes of the upper floor to be extended just a little bit. Picking out the right make of loft ladder is important, as you want to be sure not only that it fits neatly in place, but that it also matches the upstairs interior decor of your property. Timber loft ladders, for instance, fit neatly with a calm, neutral landing that you find in most homes these days – but they are more fragile than the more popular metal models, and as a result require extra care and maintenance (such as varnishing, sanding etc.) in the long run. Metal loft ladders, on the other hand, are more sturdy and secure, but do look a bit out place in warmer home environments – so you need to decide what works best for you. Make sure you choose a model with the right number of slides too; the ladder should pull down and rest at a 45 to 75 degree angle at the very least. If you are removing and replacing the loft ladder by yourself, remember to take as many precautions as possible. Clear the landing and loft area around the hatch of any mess and clutter before you begin, and make sure the light bulb is working in the loft too – if not you can always set up some portable lights nearer the hatch to make things easier as you work. If you are enlarging the size of the hatch to fit in your new ladder, it never hurts to have your wood and lining all pre-cut as well; that way it’s simply a case of assembling things in one short burst rather than trying to everything all at once. When you purchase your new loft ladder make sure you read all the installation instructions carefully before diving straight into the DIY handiwork. Gather all the equipment you’ll need, and check and re-check how everything will work with a step-by-step practice plan, just to be on the safe side. 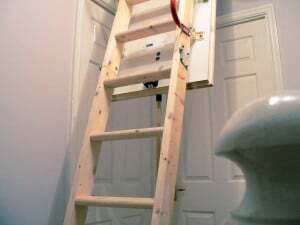 You should also make sure you purchase a ladder that will actually fit to your loft hatch before making any purchases; standard loft ladders are usually manufactured with a 760mm length and 510mm width, but check that this is exactly what you need by measuring your loft space and existing ladder. It is important to remember that these tips are only meant as basic advice guidelines, and if you are still unsure of how to install a loft ladder or lack the required confidence and/or experience and don’t fancy fitting a loft ladder yourself, you can always hire a professional loft contractor to do the job for you. They will know exactly how your chosen model works and will be able to figure out the best, most efficient and secure way to fit it up as safely as possible. Plus they might even be able to recommend certain retailers or manufacturers who offer loft ladders at discount prices or special offers – saving you a bit of extra cash as well as all the hassle that comes with installing a new loft ladder. Laying Concrete in your Home : What is the cost?